Ready to Move In, Limited Units to Go! Studio/ 1bedroom, 2bedroom SOLD OUT! D’Esplanade Residence features 602 units of luxurious residential units that are 33 stories high, with spacious built-up ranging from 1169 square feet to 10,000 square feet. With a private entrance, individual car park, personal lift lobby and private swimming pool, D’Esplanade Residences is dedicated to your privacy. Each unit is designed with glistening curtains of glass windows to maximize the spectacular views of the city skyline. In addition to a breathtakingly innovative common pool, there’s also the added bonus of gorgeious private pools and gardens to be enjoyed. Be part of the most desirable address in Johor Bahru! Sale with full ID package (as you seen in show unit), just bring your luggage in! Special cash rebate for limited period only! The most popular and famous shopping mall in JB now! Stylish Contemporary Ballroom, capable of accommodating 1,000 people. The LARGEST 5-star hotel in JB now! 4 – tiers security system. The MOST luxury condo which ready to move-in SOON! KSL Holding Berhad has been in the property development industry for more than 30 years, listed in Bursa Malaysia, Property Sector. 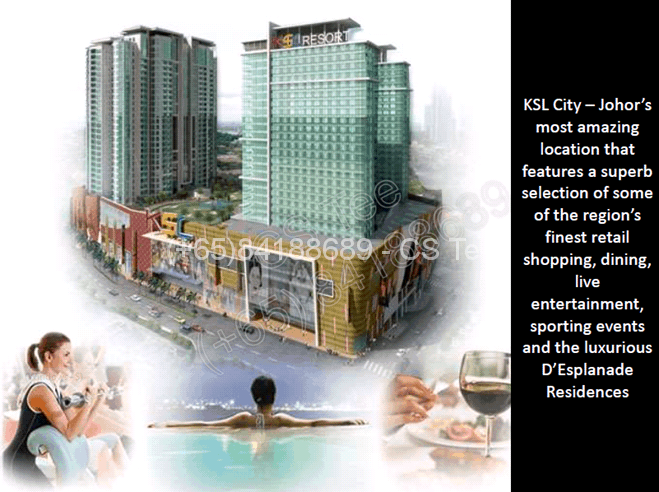 Why KSL City- D’esplanade Residence? Situated at the heart of Johor Bahru City Centre and here, you are only DOOR-STEP away from shopping malls, restaurants, and educational institutions. Easy access to a variety of amenities and attractions via Inner Ring Road, EDL, Jalan Skudai & Coastal Highway. Please send your enquiry or call us.